2 Cut the Tape. With scissors. 6 Was the Seventh Seal Ever Revealed? 7 If the Seventh Seal is the Third Pull, what is the Third Pull? The seventh seal in the Bible is a half-hour of silence. In contrast, William Branham talked for two hours about it, yet tried to avoid saying what it actually was. Click here to learn more about the Third Pull. Cut the Tape. With scissors. William Branham actually felt that he had said too much during the sermon, so he went back and edited the sermon. To do this, he cut the tape, recorded a new ending, and taped that new ending in. 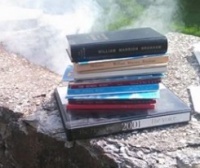 Thankfully, Voice of God Recordings released both endings after his death, so we know that the revised version omitted the story of "The Kings Sword" in Sabino Canyon, and a statement that the pillar of fire whirled toward a tent ministry. The Sword that William Branham said he received was “The King’s Sword”. It was not the sword of a prince, but a word of judgment. The pillar of light that went to the tent referred to the coming fulfillment of the Tent Vision, which was the final scene in his vision of the Third Pull. William Branham talked about having a tent meeting near the end of his life, but this never happened. 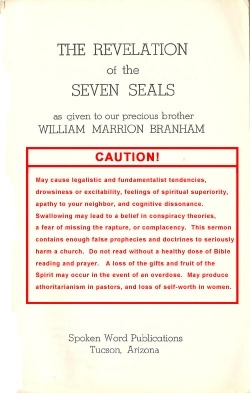 William Branham compared Jesus’ words in Matthew 24 with the revelation of the seal, and noted that Jesus did not talk about the seventh seal. Not to be outdone by Jesus, William Branham went on to talk about the seventh seal. During this sermon, William Branham also paralleled himself to an Angel, and possibly even God. William Branham’s statements from this and following sermons have been used by the “Christ Branham” movement and Fred Sothmann to say that William Branham was greater than Jesus Christ. Using the logic that since only God the Father knows the contents of this Seal (remember that even Jesus did not know the hour or day) then William Branham must be God the Father because he alone knew the contents of the Seventh Seal, even though he didn't say what it was. You would think that theses doctrines would have ended with William Branham's death in December 1965, or his burial in April 1966...but they did not. Fred Sothmann was one of the two men who hunted with William Branham on Rattlesnake Mesa (Sunset Mountain) when he said he received his commission to preach the Seals. Fred was called upon during the Seventh Seal to “Amen” as a witness. In the online version of the Message search program, the word “it” is not capitalized. However, in the printed version distributed in 1993 by Voice of God Recordings, every “It” is capitalized. Voice of God Recordings obviously felt at some point that the “It” referred to a person. Notice, it's the end of the church age. It's the--the end of the Seven Seals. It's the end of the trumpets. It's the end of the vials, and even ends the ushering in of the millennium; that's on the Seventh Seal. We must not forget that the “SEVENTH SEAL” includes all that happens during the sounding of the “Trumpets,” and the pouring out of the “Vials,” and so extends down to the ushering in of the Millennium. And the four and twenty elders that stood before God there harping with their harps, they quit playing their harps. The Angels hushed their singing in heaven. Think, the holy Cherubims and Seraphims, that Isaiah saw it in the temple with six sets... or three sets of wings, three on--two over his face and two over his feet, and flying. And he's day and night they're before God, saying, "Holy, holy, holy, is the Lord God Almighty." And even when they walked in, or come into the temple, the posts of the temple moved with their--their presence. And these holy Seraphims hushed up. Angels quit singing. (Whew.) Flying in the Presence of God, singing, "Holy, holy, holy..." they shut up. Now, a half hour might not be long if you're having a good time, but in the suspense of between death and life, it seemed like a millennium. Now a “half an hour” is not long when engaged in some pleasant employment, but it causes a nerve breaking tension when we do not know what is going to happen, and when a life is at stake a minute, or even a few seconds, seem to be hours. The suspense of the half hour of SILENCE in Heaven was intense. Was the Seventh Seal Ever Revealed? William Branham taught that The Seventh Angel is on the Earth at Christ's Coming. This means that if his ministry is true, the Seventh Seal would have had to have been opened before his death, and that time should currently be no more (check your clock to see if time has ended). William Branham confirmed this when he released the Church Ages Book in 1965. The Seven Thunders were revealed in the Seven Seals. If the Seventh Seal is the Third Pull, what is the Third Pull? William Braham said the Third Pull was many things, most of which relate to stories or events that occurred before he preached the Seals (like Hattie Wright and the squirrels). What did William Branham say was the vindication of his ministry? It was his own private interpretation of scripture. The Islamic Prophet Muhammed's vindication was the writing of the Koran and his angelic visitation in Jerusalem. So too, William Branham's vindication was the Angelic Revelation of the Seven Seals on Sunset Mountain. Too bad the third pull was mimicked 1,400 years before William Branham's passing. This page was last edited on 23 August 2015, at 21:41.